The much awaited Tigmanshu Dhulia film ‘Raagdesh’ is all set to release on July 28th, 2017. Expected to be a crossover film, the film marries the historical authenticity with entertaining cinema, a genre much missed in Bollywood. Set in the backdrop of the famous ‘Red Fort Trials’, the film recreates the era of last days of freedom struggle in India, where the battles were being fought on borders, on streets, in media and curiously enough, in the court room. The film captures the courtroom drama of the trials conducted by the British government in 1945 against the top brass of the Indian National Army, established by Netaji Subhash Chandra Bose. The trials that were observed with great curiosity by the world forces who had won the World War II, as also by the nation who now witnessed another streak of patriotism which was valiant, violent, vociferous and quite different from non-violence practiced by the Congress. The trials made India aware of the heroic deeds and struggles of the INA, which was till then suppressed by the British authorities through strong armed press censorship. As the trial progressed, the entire nation was galvanized into the final call for independence, leading to Mumbai Naval Mutiny and crumbling of British Empire. The film poignantly portrays the battle travails, border sacrifices and trial of three heroes of INA who changed the course of freedom struggle. The film is produced by Rajya Sabha Television, who has joined hands with UFO Moviez as its strategic partner for a pan-India release. The film marks the debut of RSTV, which has started an ambitious programme of bringing the exciting events of contemporary history on to the cinema screens. “India today is a leading nation of the world. There have been people, events and processes that have led to the success of India. RSTV feels that people must know their history in order to preserve their growth. It is the duty of the state and the governments to promote it. Being a public broadcaster, RSTV felt its duty to take history to the people in an entertaining format. We always felt that history has so many fascinating stories to tell and films have been the most powerful and entertaining medium to tell stories”, said Gurdeep Sappal, CEO and Editor-in-Chief of Rajya Sabha Television. 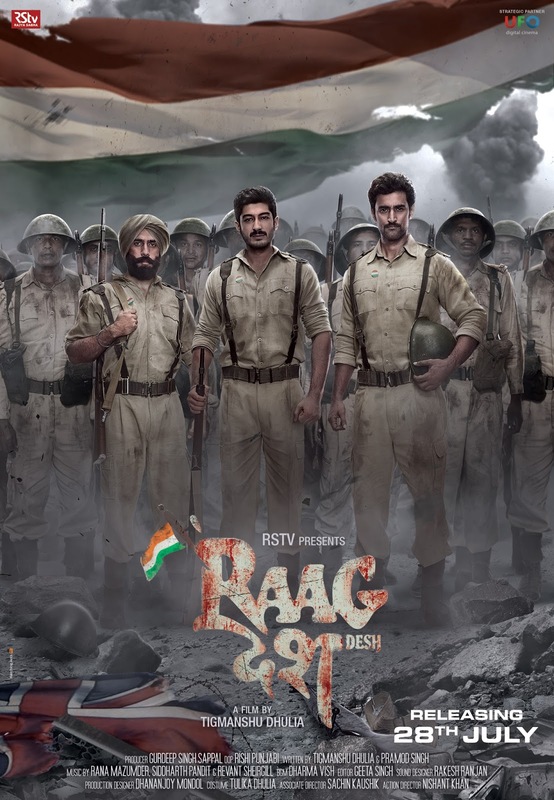 Starring Kunal Kapoor, Amit Sadh and Mohit Marwah in the lead roles, Raag Desh is the story of three leading officers of the INA namely Colonel Prem Sehgal, Colonel Gurbaksh Singh Dhillon, and Major General Shah Nawaz Khan, who were captured and imprisoned in the Lal Quila (Red Fort). British wanted to sentence them and hang them in the Red Fort, precisely where Netaji Subhash Chandra Bose wanted to unfurl the Tricolour flag. A trial that the world watched and the nation prayed, eventually turned up as the last message to the British that they would now have to Quit India. The Tricolour flies on the Red Fort since then!